PM summoned to discussion after 40 opposition MKs sign demand for hearing on his investigations before Knesset plenum. 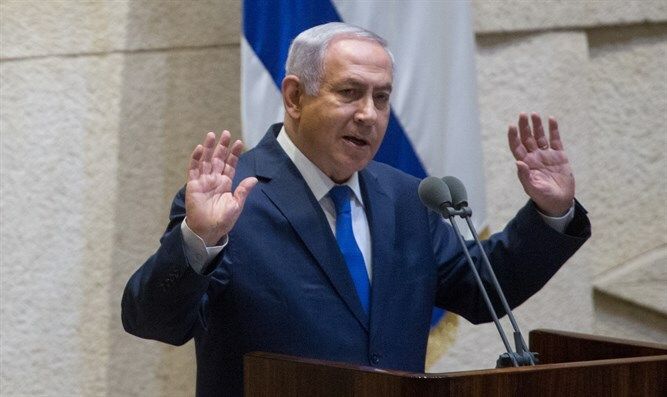 Prime Minister Binyamin Netanyahu spoke today in the Knesset at the conclusion of a meeting convened by 40 opposition MKs regarding investigations linked to him. "Today is a distressing day for the State of Israel. Our government behaves responsibly, judiciously, steadfastly, and brings great achievements to the State of Israel. The citizens of Israel know how to appreciate what we do for their benefit. I say this not because I fear elections; on the contrary. The public sees our achievements. Throughout my years, I haven't seen such support for me, my family, and for the policy of the government headed by me." Netanyahu declared he is uninterested in early elections. "If there are elections, we'll run and we'll win, but we're not there yet. The hour is late, but not too late. We must make a final supreme effort to preserve the government in its current composition for a length of time." He also appealed to opposition MKs. "You need to appreciate the Israeli public a bit more. They know how to sense the difference between truth and lies. I heard your words and I didn't fall out of my chair. You always talk high in the clouds and then the dust settles, the cloud dissipates, and the words turn out to be nonsense. "The public knows how to differentiate between your complaints and my ceaseless activity. Therefore the public decides every time that I will stand here and you will sit there as an opposition," added Netanyahu. He added that "the opposition wants the government to continue to serve because it's afraid of elections and this is the simple truth. Also you know your statements are empty."